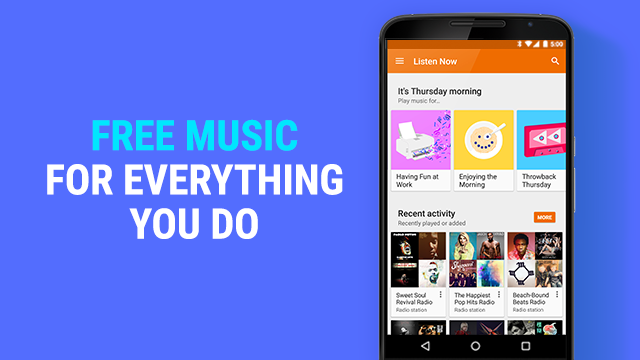 Google Play Music follows the footsteps of Spotify , today they announced a free, ad-supported tier of Google Play Music in the United States. but for US only. Now you can listen to free Internet radio stations using the Google service. The free version of Google Play Music will play ads in between songs every once in a while. In addition, Google has also taken away the ability to listen to any song you like. Instead, if is offering a curated playlists to suit your every mood, occasion and day. These curated playlists have been available to paid Google Play Music subscribers since last year. Each of these radios was prepared for the needs of the listener: from music to concentrate on work, to another for the moments of freedom, that to dance wildly. To give you a better idea, you can see the 10 most popular activities, each of which offers a variety of radio stations to listen to. The idea is simple and logical: to test the potential of the service, in the hope that users later decide to switch to the paid version, which is ad-free, allowing you to download music online , create your own playlist , and listen to any song in the catalog of over 30 million pieces of Play Music. In addition there is also listening in the background and the offline download music videos to YouTube . Remember, however, that, even without shedding a donation, you can still save 50,000 songs in your cloud Play Music : not cheap. No news at the moment on the international availability of Play Music ad-supported, but we will let you know as soon as it will arrive in our country.